One of the most interesting places we went to was Rincon de la Vieja National Park. 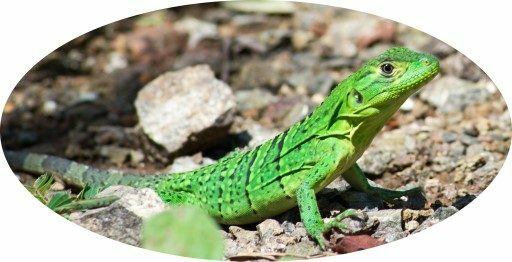 This is a beautiful volcanic area with many of those small electric-green iguanas. It’s not much hiking to visit the mud pots, which there are several of scattered around, and at each one there is at least one lookout point, a lot of steam, and of course the lovely sulfurous smell. It is best to get there early in the morning because the park closes at 4:00, and there are normally a lot of people. When we visited, we saw the mudpots and then took a separate 5 kilometer hike to a waterfall, which had great views in a few stretches. There were many bridges and creeks to cross, and it was a great hike. However, there were a few places where it was difficult to get up and down, like when the path was muddy and practically vertical, with nothing but trees and roots to grab onto to progress on the path. This made the hike enjoyable, but I recommend wearing old shoes and not doing the 5 kilometer hike unless you are reasonably athletic and do not have young children with you. Bring plenty of water; it will be necessary, and if you don’t want to carry all of it, leave a giant bottle in the car for when you get back. Rincon de la Vieja was a very fun and challenging experience and I highly recommend it.